A. Mavroudis, for the respondent. The appellant, Mrs. Saeeda ANWAR, sponsored the application for landing of her husband, Mr. Shakeel Zaheed, the applicant. The application was refused as the visa officer found the applicant to be person described in section 19(2)(a.1) of the Immigration Act and, therefore, found him to be inadmissible to Canada. Specifically, the visa officer found there to be reasonable grounds to believe that the applicant has been convicted outside Canada of an offence that, if committed in Canada, would constitute an offence that may be punishable by way of indictment under any Act of Parliament by a maximum term of imprisonment of less than ten years. In this regard, there is evidence that the applicant was convicted on January 26, 1994 of driving with an undue proportion of alcohol in his blood, pursuant to section 53(3) of the Danish Road Traffic Act. 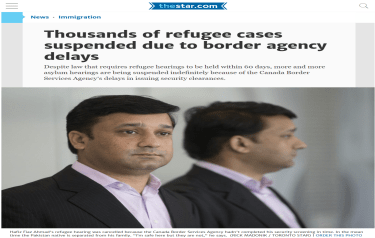 The visa officer found that the Danish conviction was the equivalent of a conviction pursuant to sections 253 and 255 of the Criminal Code of Canada (the “Code”). The appeal from the refusal of the sponsored application for landing was heard on December 1, 1997, at Toronto, Ontario, with Mr. Max Berger, Barrister and Solicitor, representing the appellant and Mr. Andrew Mavroudis, Appeals Officer, representing the respondent Minister of Citizenship and Immigration. The appellant concedes that the applicant was convicted of the offence set out in section 53(3) of the Danish Road Traffic Act. In addition to the appellant’s concession, there is the police certificate to this effect, [See Note 1 below] as well as the applicant’s eventual admission, according to the statutory declaration of the visa officer. [See Note 2 below] However, the appellant disputes that this offence is the equivalent of the Canadian offence of operation while impaired, set out in sections 253 and 255 of the Code. In this regard, the appellant submits that the two offences are materially different, in that the Danish provision [See Note 3 below] focuses on the operation of a “power-driven vehicle”, whereas the Canadian provision makes reference to a “motor vehicle”. The appellant submits that the Danish provision is, therefore, broader than the Canadian provision, as it does not exclude the operation of a muscular powered vehicle, whereas the latter does, when the definition of “motor vehicle” in the Code is considered. The appellant, therefore, relies on the case of Li [See Note 4 below] to submit that the two offences are not equivalent, as the Danish offence is broader than the Canadian offence. Relying further on the case of Li, the appellant also submits that the two provisions are not equivalent, as the Canadian provision provides for a defence which the Danish provision does not. In this regard, the appellant submitted that the defence arises from section 254(3) of the Code and the two hour window to which the reasonable and probable grounds to believe that an offence was committed must attach, whereas the Danish provision sets no time limit. Note 4: Li, Ronald Fook Shiu v. M.E.I. (F.C.A., no. A-329-95), Strayer, Robertson, Chevalier, August 7, 1996. Having considered the submissions of both counsel and the related evidence, the panel finds the refusal to be valid in law, as on the evidence adduced and on the balance of probabilities, the offence for which the applicant was convicted under Danish law is the equivalent of that under Canadian law. In accordance with Li, all that is required for the offences to be considered equivalent is that the definition of both offences be essentially similar, to the extent that they involve similar criteria for establishing that an offence has occurred and that such similar criteria extend, not only to the elements of the offences, but also to the available defences. The two offences need not, therefore, be identical. The respondent has prima facie demonstrated that the two offences are essentially similar. While counsel for the appellant has suggested that the Danish provision is broader, a reading of section 53(3) together with the ensuing section 54(2), which refers to other vehicles such as cycles and horse-drawn vehicles, suggests that the former section is meant to exclude such vehicles. Furthermore, the appellant’s counsel has not adduced all of the relevant provisions of the Danish law, including the definition of a “power-driven vehicle”, which may more specifically exclude other muscular powered vehicles. Also, the Canadian offence is not as narrow as the appellant’s counsel suggests, as it refers not only to a motor vehicle, but also to a vessel, an aircraft, and railway equipment. Moreover, the fact of the matter is that, on a balance of probabilities on the evidence adduced in this appeal, the applicant was operating a motor vehicle, not a muscular powered vehicle. While counsel for the appellant suggested various scenarios, for example, that the applicant may have been behind the wheel of a car which had no motor and which was being pushed from behind by his friends, counsel’s submission has no merit, as the evidence clearly shows otherwise. The appellant testified that the applicant was drinking and driving — a car. Furthermore, in answer to whether another car had been involved in an accident caused by the applicant, the appellant testified that there was not, and the applicant had, instead, caused some property damage. Also, there is reference in the documentary evidence, as also confirmed by the appellant, that the applicant’s driver’s licence was suspended, which is further evidence of the vehicle having been a car. As for the appellant’s counsel’s submission that the Danish provision does not provide the defence which the Canadian one does, the panel again notes that the appellant has not adduced all of the relevant portions of the Danish code in support of this submission. As in the Canadian Code, it may be that a time limit is referred to in a later section, or perhaps has been established by case law. Turning to the other ground on which the appellant bases her appeal, namely that there exist, pursuant to section 77(3)(b) of the Immigration Act, compassionate or humanitarian considerations that warrant the granting of special relief, the panel finds that the appellant has met this onus. The offence which the applicant committed is a serious one, which this country is also endeavouring to tackle, and, in the applicant’s case, involved damage to property, the circumstances of which were not adduced. However, the conviction was registered in 1994 and, since the applicant’s licence was suspended for a period of three years thereafter, it is unlikely that a further offence of such nature has been committed. While it would appear that almost one year has lapsed since the expiration of the suspension, the appellant, who was a frank and credible witness, as she also revealed information which was unfavourable for the applicant, testified that she is not aware of the applicant having committed any other offences. Furthermore, while the appellant herself indicated that she had been concerned about her husband’s drinking, in that she came to know after her marriage to him in December 1992 that he would drink in the company of friends, as were the likely circumstances from which his accident had arisen, she suggested that the problem had abated and that the only remaining problem was their separation from one another. With regard to the credibility of the appellant in this regard and her spontaneous and frank testimony, the panel also notes that the respondent’s counsel, whose questioning was focused on the appellant being better off living in Denmark with her husband, undertook no cross-examination of the appellant regarding the circumstances of the offence and the applicant’s rehabilitation. While there is also the matter of the applicant not having disclosed his conviction in his application for permanent residence as he was obligated to have done, the appellant explained that he was motivated by his hope of being able to be reunited with the appellant and their two children, the younger of whom he has not ever seen. The panel also considered that the appellant and her two children are Canadian citizens, and that each of them wishes to be reunited with the applicant. A dismissal of the appeal would amount to the appellant and her children having to uproot themselves from Canada to join the applicant in Denmark. However, the appellant was landed in Canada in February 1992 and has all of her immediate family here, as well as much of her extended family. Furthermore, her mother, who suffers from various ailments, relies on the care which the appellant provides. While the appellant has six other siblings here, the uncontradicted evidence is that it is she who most assists her mother, as she lives with her parents at this time and is otherwise occupied only with the care of her children, as she does not work or go to school. Although the appellant testified that she would soon be moving into her own apartment, in anticipation that her husband will join her in Canada, she testified that she will be only a five-minute walk away from her mother, and still be expected to provide the same care for her. Furthermore, the appellant is suffering from depression due to her separation from her husband. While her depression would be alleviated by a reunion with her husband in Denmark, the separation from her family in Canada would also be a cause for anxiety. Also, while there are no definitive plans for the applicant’s future in Canada in terms of his employment, the evidence adduced indicates that the applicant, who has resided in Denmark since 1972, has some work experience, having previously operated his own business and presently being on his way to becoming a taxi driver. In this respect, there is, therefore, some evidence that the applicant would be a source of support for the appellant, whereas she is now receiving social assistance. Finally, while the respondent submitted that it will be open to the applicant to pursue the exemption contained in section 19(2)(a.1) of the Immigration Act with respect to satisfying the Minister that he has rehabilitated himself, the panel is nevertheless required to make a determination, at this time, regarding whether the granting of special relief is warranted. The refusal of the sponsored application for landing is valid in law. The appellant has shown, pursuant to section 77(3)(b) of the Immigration Act, that there exist compassionate or humanitarian considerations that warrant the granting of special relief. The appeal is allowed. Dated at Toronto this 2nd day of March, 1998.